Ok, so as promised, I am trying again. iPad and I aren't jiving, except the Pinterest app... Lovin that! I'm in West Palm Beach, FL, attending a Live event with John Maxwell to become a certified trainer/ coach/speaker. I've studied his books on leadership for years!! I absolutely love his attitude and overall philosophy. I've tried to infuse his leadership principles into my practice, as well as build a "culture" in my clinics. Today, we got some heavy duty teaching from the master himself. I'm not quite positive what I intend to do with my new certification, but I'm sure that will all be clear in time. I had to do a five minute speech today. I told Jake's story, with a little Ellie Sue tossed in. Regarding the perfect timing of her birth and the preordained short life Jake had. A life of purpose. And now realizing the reason I didn't have kids til nearly 40. God had a plan for me...as encourager, support to my sister, playmate to Jake, in my childbearing years. And nothing I would trade at all now. The theme of my speech began, "Our life's tragedies sometimes manifest our biggest blessings". I haven't updated my iProducts, so I can't use iCloud to move my pics to my iPad. Dang! More on this great experience when I'm back safe and sound in Louisiana! Oh I like that theme/sentence, Mo! Everything happens for a reason and at a specific time, even tragedies! 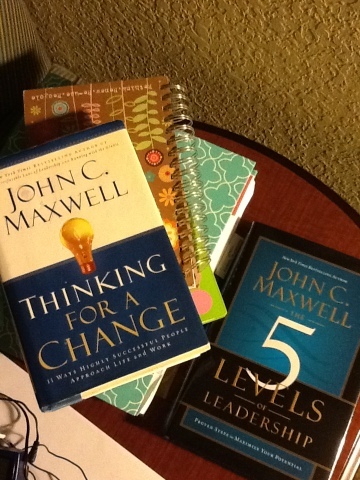 I've been in John Maxwell's presence and had the opportunity to talk with him...he IS so articulate. I was like a sponge..soaking it up. Nothing like maintaining a positve attitude for anything less is just a nesting place for failure. I know you have been blessed in this course. Can't wait to see what you do with it. Not sure your aware of a $5 adapter from amazon that will allow you to load your pics from your SD camera card straight to the iPad. No cloud needed. Wish u were close - I could use a life coach! And I love your culture at your clinics! I have taken the opportunity, several years ago, to be Live in John Maxwell's presence. It was very rewarding. I've also attended several similcast (I'm sure I spelled that wrong) where he taught. He is an amazing man with lots to share. Can't wait for you to use your new information. I bet your speech was fabulous. If you speak like you write your blogs, I'm sure you had everyone's attention.